A new start-up cannabis business called Treeworks is taking a grassroots approach to the burgeoning legalized marijuana industry in Massachusetts by working out of a home kitchen to develop a line of locally sourced products, including cannabis oils, edibles such as gummies, tinctures, topicals, and cannabinoid infused Kombucha. Treeworks is the brainchild of three Pioneer Valley residents in their mid-to-late 20s – Timothy Kane, Milo Childs Campolo, and MacKae Freeland, all of whom grew up in western Massachusetts. The trio are currently working at of their temporary home-based headquarters in Hatfield, but plan to open up shop at a physical location in the Pioneer Valley by the end of 2018. 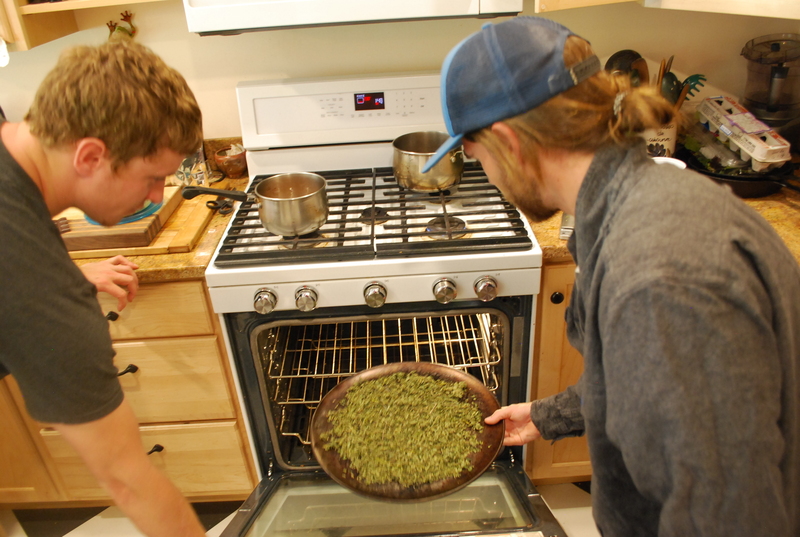 The three friends all used cannabis growing up and when news of their home state becoming a legal bastion for all things weed, they decided to go into business together. The initial dream for the business was to develop cannabis-infused maple candy edibles, but after realizing the cost of goods and conducting market research, the three partners shifted their goals to making a wider variety of cannabis products aimed at all ages of adults, MacKae said. “We want to be something for everyone and want to bring people who are not traditional consumers into the mix,” he said. There are several main products that Treeworks is planning for its initial launch, Kane said. Among them are edible gummies, which have proven to be popular in states that have legal recreational marijuana, such as Colorado. Another product is the topical cannabis pain salve, a non psychoactive cream for achy joints and sore muscles, Kane said. 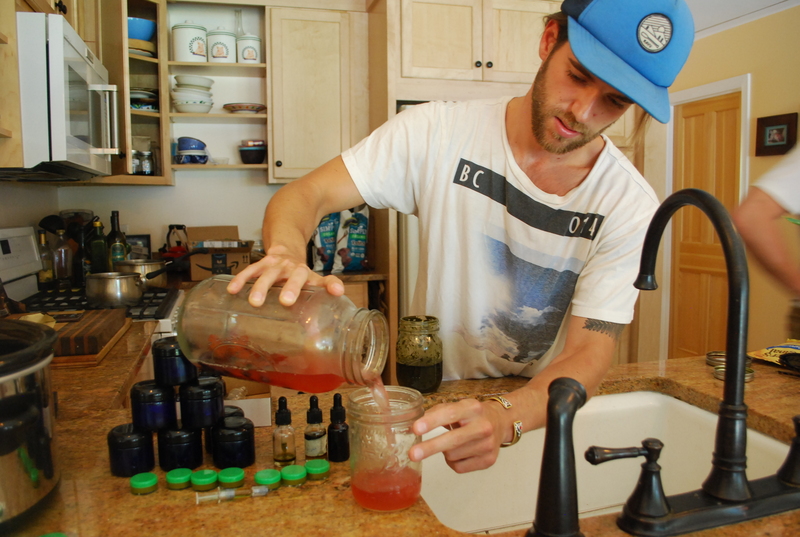 Tinctures are medicinal cannabinoid liquids that can be used in beverages, including Treeworks’ homemade peach blueberry ginger Kombucha, said Campolo, who is the head of product development. 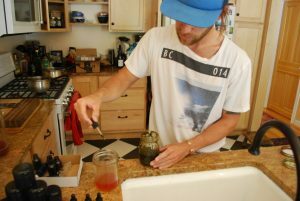 Just a couple drops of the tincture turns the Kombucha into cannabis tea. Treeworks is also experimenting with chocolate caramel turtle edibles. Heat triggers the THC, Campolo told the Valley Advocate as he placed a tray of cannabis in the oven and stirred chocolate and caramel on the stovetop. Treeworks is also planning a DIY cooking with cannabis classes with local chef Rick Gifford that would show people how to make cannabis-infused food, Kane said. “We want to infuse a few different cooking oils with cannabis and then offer them to adults to use at their own known doses at home,” Kane said. Other products include cannabinoid-infused distillate oil vape cartridges, which is one of the biggest cannabis-related products out in legalized western states, MacKae said. “It takes the raw cannabis flower; cannabis extract oil and then you take that oil and refine it a step further through the distillation process,” Kane said. The three business partners will be financing the company through friends and family, according to Kane. Financing cannabis-based businesses has been a difficult issue as many banks refuse to work with such businesses. Treeworks will apply to the Cannabis Control Commission on June 1 for its manufacturing license. If approved for the license, it would continue with the inspection process and build-out procedure with a planned opening as early as October, Kane said. The site would include an industrial kitchen. Treeworks plans on producing cannabis products to sell wholesale to dispensaries across the state. You can contact Treeworks via email at info@treeworksma.com.